In St. Albert, a group from Paul Kane High School took to the Sturgeon River to set up water education stations and conspired with the City of St. Albert’s River Edge Enhancement Project (REEP) to work together during a community-wide river valley clean up event. Armed with water quality assessment kits from the Alberta Lake Management Society, a team of students from Siksika High School in Siksika First Nation plotted to assess not only the water quality of their school, but also that of the Wolfe and Crowfoot Creeks nearby. In Camrose, a group of students at Our Lady of Mount Pleasant High School filmed a video using claymation and Lego, and screened it as part of a demonstration on virtual water to inspire their entire community to join their water conservation cabal. The catalyst for these impressive acts of water stewardship? Navigate 2012, a three-day youth summit on water literacy where 20 teams of high school students from across the province gathered in Kananaskis, Alberta to learn about water issues and develop take-home action plans. Some of the water industry’s leading professionals volunteered as guest speakers and facilitators to cover topics such as water quality and quantity, conservation and stewardship, relationships between water and energy, and careers in the water industry. The content and activities were curriculum-relevant, and embraced many different learning styles to ensure that all of the participants would have a meaningful experience. “This group of engaged individuals worked hard, shared with each other, made a difference and had fun learning together,” says Kathryn Wagner, program manager for Inside Education. 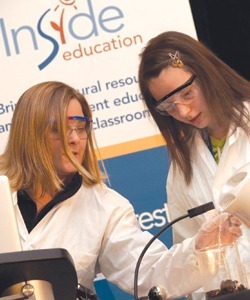 Navigate was conceived of by Inside Education with industry, government, and not-for-profit partners after the success of 2011’s Generate youth summit on energy literacy. The intent, for now, is to present the summits on alternate years; 2013 will see another Generate, and the next Navigate is planned for 2014. “We wanted to do more work with high school students, bring the experts to them,” says Steve McIsaac, executive director of Inside Education. The reception has been incredible. While there were 20 teams at the summit, there were actually 50 teams who applied to attend. The goal is to keep the numbers small, so that the event is more collaborative and interactive.